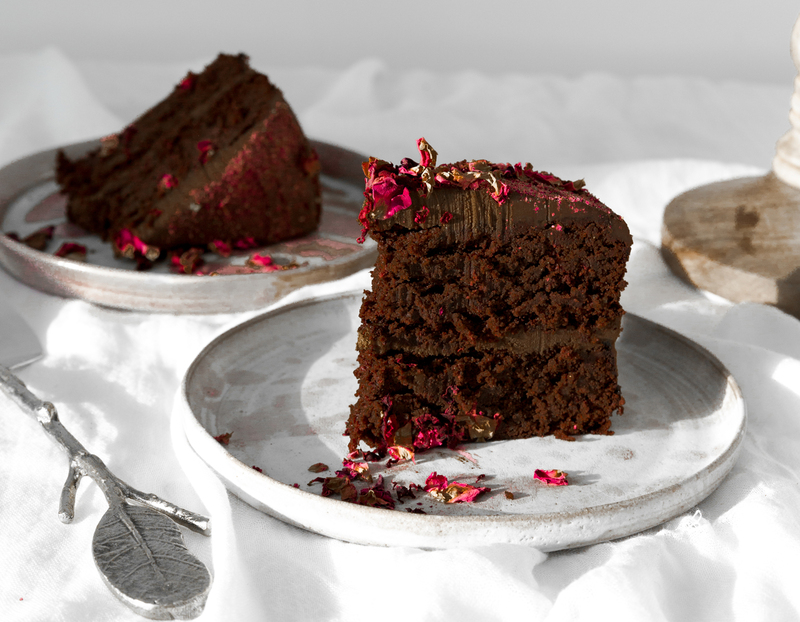 This Beetroot + Avocado Chocolate Fudge Cake is a truly indulgent treat, made from all natural ingredients. 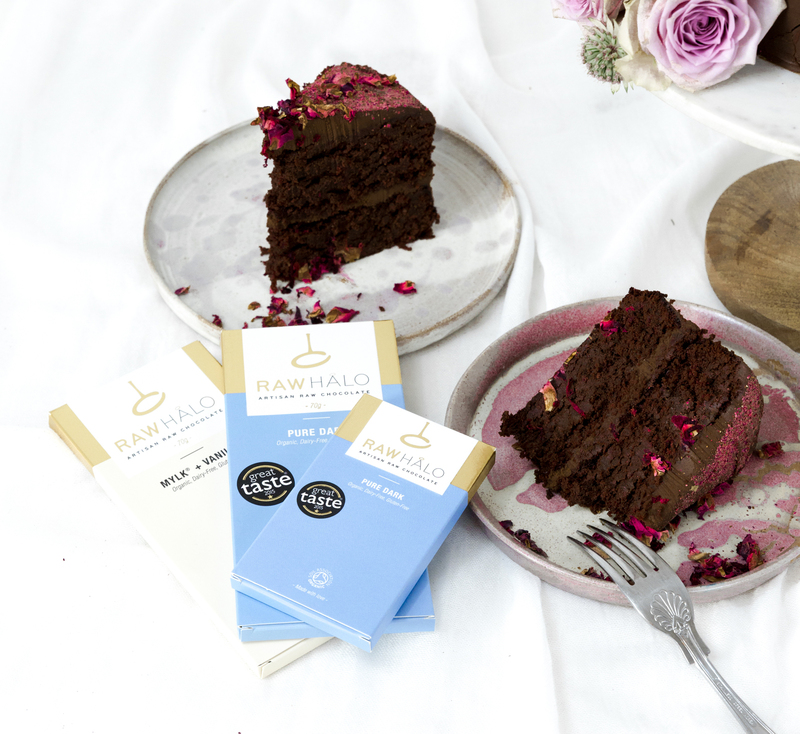 Our Pure Dark raw chocolate helps to make the perfect chocolate sponge cake, whilst Mylk + Vanilla is the perfect ingredient for the gooey buttercream icing. Being free from dairy, gluten, eggs and refined sugar, this cake can be enjoyed by all. The best way to spend a lazy Sunday morning, and then enjoyed with a generous scoop of dairy-free vanilla ice-cream in the afternoon. Pre-heat your oven to 180 degrees celsius, grease and paper line two 20cm sponge tins. Melt the Pure Dark chocolate and coconut oil in a bain-marie. Once melted, set aside to cool. In a large mixing bowl whisk the flax eggs, coconut sugar, and maple syrup until combined. Fold in the buckwheat flour, ground almonds, cacao powder, bi-carbonate soda, baking powder and pinch of salt. Next fold in the grated beetroot, (almond) milk and melted chocolate, mix gently until combined. Pour the mixture into the prepared tins and bake for about 1 hour. Once the cakes are cooked remove from the oven and set aside to cool. For the buttercream, add the avocado to a food processor and blend until very smooth. Next add the coconut oil, maple, cacao powder, salt, and blend until smooth. Finally add the melted Mylk chocolate and blend until smooth and glossy. Place the mixture into the fridge for around one hour before icing the cakes, this will help control the icing when decorating. When assembling & decorating, spread and even layer of buttercream between the cakes to sandwich together. Using a palette knife, evenly spread and distribute the icing over the entire cake. 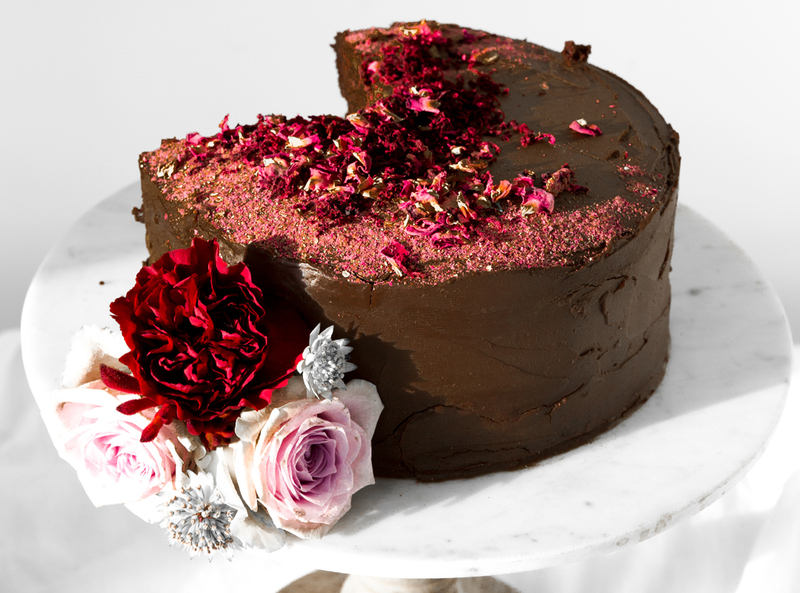 Decorate the top with anything from fresh flowers, powdered raspberries and dried beetroot.